I've been looking forward to this day! I have many many recipes, but these are the closest to my heart. 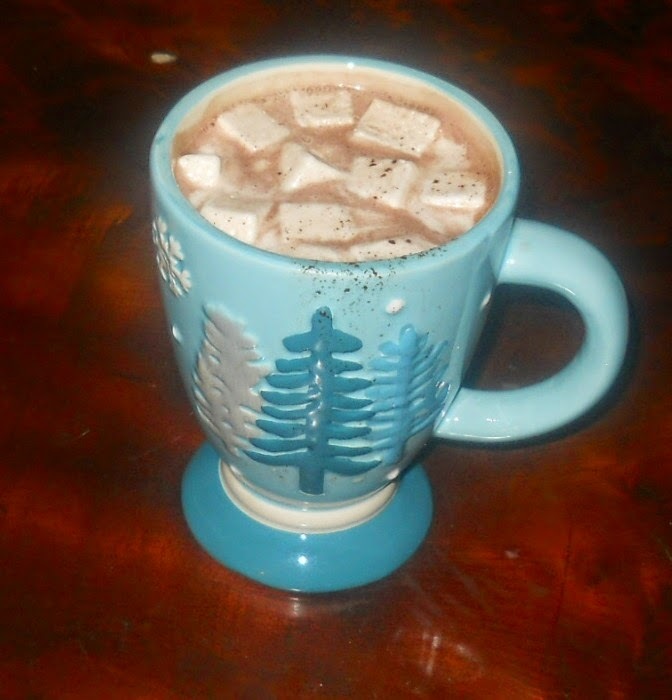 Grab a cup of my SIL's homemade hot chocolate and homemade marshmallows and join me while we chat. 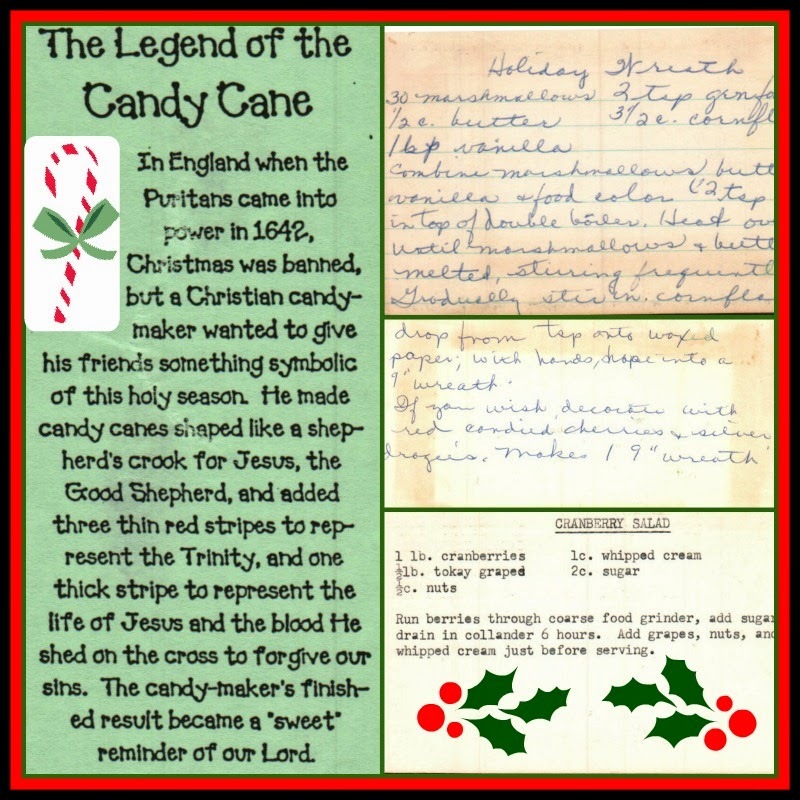 My great aunt who I only got to see a couple times a year used to make these every year special for me. My cousins and I would wait out on the front steps for her arrive just to see them, the wreaths that is. She always made them soooooooooo pretty and perfect! Aunt Louise was just plain crazy it seemed to me. I can't pinpoint any one thing that made me think that, but as the years wore she continually proved it. Let's just say if the made a movie of her life, Shirley MacLaine would play her part. Aunt Louise reminds me of Shirley's character Ouiser Boudreaux in Steel Magnolias. Combine marshmallows, butter, vanilla and food color in top of double boiler. Heat and stir frequently until well blended. Gradually stir in cornflakes until well blended. Drop onto wax paper and arrange into wreath shapes. I plop them onto the wax paper and then push out from the center to form the wreaths. If your house is warm - chill in refrigerator until set. Many Christmases ago I stood in my childhood kitchen watching my dad prepare the stuffing for dinner. Daddy never stuffed the Turkey, but instead made the "stuffing" like a big casserole. The stuffing was always my favorite part topped with daddy's giblet gravy - YUMMY. I can taste it like it was always those years ago again. Several years ago my brother asked me to try and reproduce the recipe as a scratch recipe and VOILA', I did it! This wasn't easy since daddy started with a box of Mrs. Cubbinson's cornbread dressing cubes and then started winging it from there. 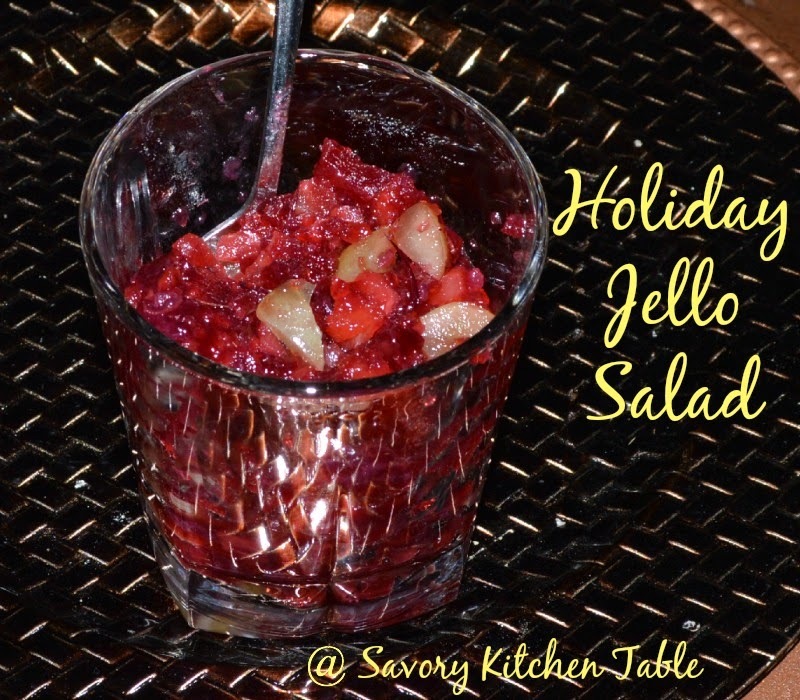 Now there is much debate over Gran's cranberry salad recipe, but one thing was for sure she'd have to make a double batch, one for my mom and aunt and another for everyone else. Now while I usually helped prepare the above recipe, I hated it!! One year she even decided the grapes needed to be peeled - need I say more? I much prefer the recipe below. Shhhh, don't tell anyone, but I've already eaten a whole batch by myself. In my defense it was while I wasn't feeling good and had a sore throat. Dissolve the jell-o in the boiling water in a large bowl. Fold in the pineapple and cranberry sauce. Fold in grapes and pecans if desired. Now on to the REALLY yummy stuff! Line a 13x9 cake pan with heavy duty foil, leaving plenty on the edges to use as handles later. This will make clean-up so much easier. In a medium mixing bowl stir together the pretzels, sugar and melted butter until well blended. Press the pretzel mixture evenly into the bottom of the cake pan. In a medium saucepan melt butter over a medium heat. Whisk in the whipping cream and brown sugar until sugar is dissolved. Stir in caramel bits, stirring constantly until bits are melted and sauce is smooth. Add in peanuts to coat well. Immediately pour over pretzel layer, spreading evenly. 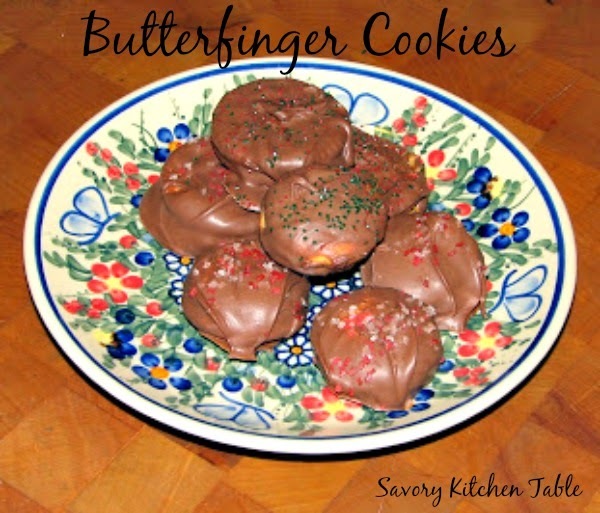 Scatter each of these over the caramel layer. Bake 25-30 minutes or until edges are bubbling. Lift foil edges to remove bars from pan. Layer between wax paper in an airtight container. I store them in the fridge, but the can also be frozen for 3 months. Those wreaths look like a lot of fun! I hope to get to do some baking soon! This one I will do because it doesn't require "baking" and can be whipped out pretty quick. I have a great recipe for Pumpkin Cinnamon chip cookies to share today but I forgot to get it ready... Need to get working on it! Thanks for sharing these delicious looking treats! All of your recipes sound wonderful - but those chunky monkeys- HELLO! LOL I swear they wrote that part based on my aunt - I mean even the name is really close to being the same. I hope you enjoy the Chunky Monkeys as much as we do. Aside from that, I LOVE the recipes and I'm drooling. LOL I probably can't pinpoint it because she was ALWAYS the same my entire life! I sent you a little something to help with the drooling, but mainly to say thank you for hosting such a fun Christmas BLOGMAS 2014. The wreaths look soooo good. OMG the Chunky Monkeys!! I just might have to try those!! 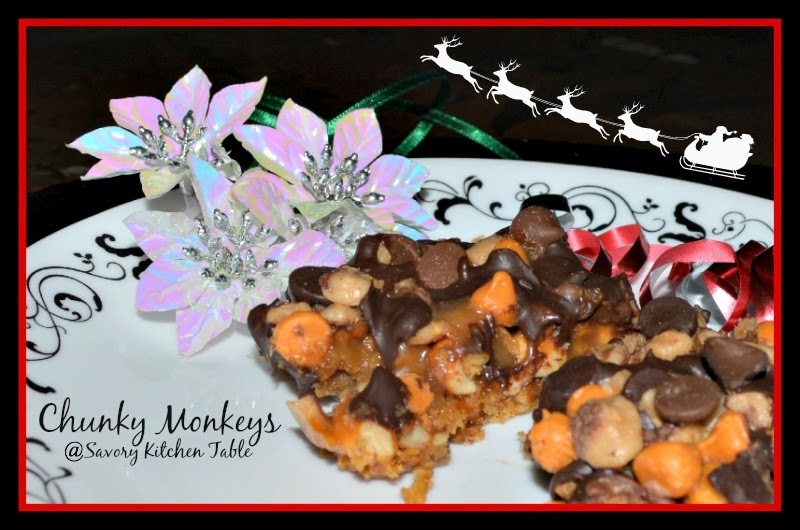 Be careful, those Chunky Monkeys got that name for a reason - they are addictive and rich! Oh, these recipes look just DELICIOUS!!!!!! LOL about the peeling of the grapes!!!! LOL to this day I always think about peeling grapes every time I eat one.